Card measures 5.5" x 4.25" and comes with an envelope! Hello! My name is Sarah Donovan, friends call me Sarah D. I design custom stationery from fine art prints, wedding invitations, hand painted shower invites, place cards, menus, programs, posters, monograms and specialty packaging for events. The Stationery Bakery is located deep in the heart of Texas….Austin! If you are looking for cookie cutter invitations, I may not be the best fit! As the designer, I like to get to know you and learn more about your event and your custom tastes. I only use the best ingredients! Once I have listened to your ideas and pulled together the raw materials to make them come true, I will whip up a custom recipe and give it to you fresh out of the oven. 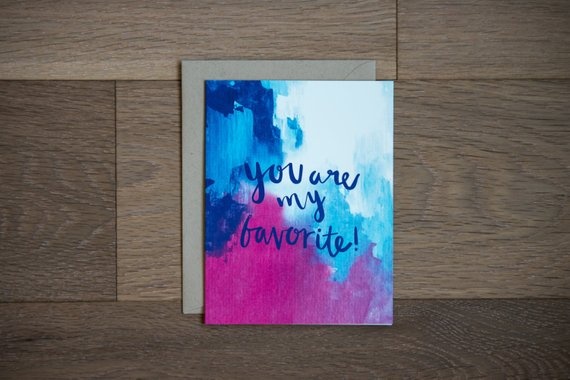 My inspiration comes from a deep love and appreciation of typography, illustration, specialty paper, packaging design and the simple joys of life! I am the artist and designer, and my sweet husband helps with the business side! Take a look at some of our work and let us know how we can help you!